I worked with 3 Deutsche Telekom colleagues on this project. Identify new customer segments and product ideas for Deutsche Telekom. Share them with Deutsche Telekom's top 70 executives and elevate the perceived value of design research in the organization. As a team, we scoped the details of the project. Online research, competitive landscape analysis, surveys of current trends, and customer reviews set context. We selected 3 underserved user groups: teenage girls, senior men, and working mothers. We designed "homework" for users including 2 mapping activities. At users' homes, we engaged in contextual inquiry, touring their homes and asking questions. After interviews, we used tools like body maps, Say-Do-Think-Feel maps and mood boards to synthesize findings. We pulled out key findings for each user group, created personas, and built replicated user rooms for our workshop. We walked the Deutsche Telekom executives through the rooms and helped them uncover core insights through artifacts in the rooms. We found that senior men validate their vitality by engaging in opportunities that position them as leaders and teachers. Each senior that we met with was proud to share stories of how he was continuing to share his expertise with the world. One organized public hikes on his favorite trails, another had regular meetings scheduled with friends so he could teach them how to use computers, and another spent many of his days writing and publishing Wikipedia articles about train history. The men value being able to contribute to their communities because it gives them purpose and reassurance that they are not only dependent. The executives described this workshop as the highlight of their innovation week and one of the best sessions since 2009. They left energized by the potential of the new user groups and solutions they generated during the workshop. All ideas and research findings were documented in a 118-page magazine and sent to executives. 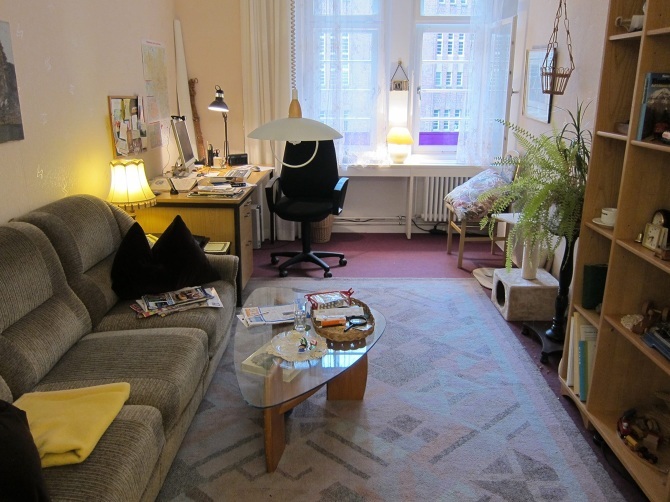 I conducted 5 user home interviews in German, led synthesis of findings for the senior men group, created the persona, and helped plan the contents of the room replica.